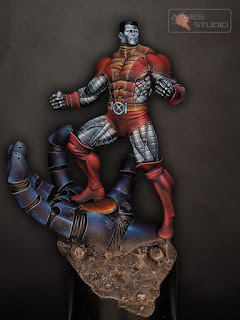 [Es] Añadimos un nuevo Superheroe a la lista de ellos que he pintado antes :D. Esta vez se trata de Coloso, de X-Men, también de knightmodels en 80mm. Muchos de vosotros que me seguís en Facebook, habréis visto fotos del proceso tomadas con el móvil, los que no, no se a que esperáis! 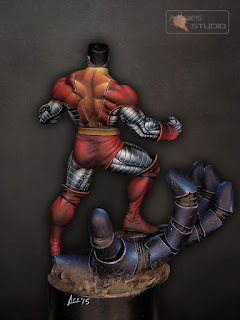 La figura es una gozada, la anatomía es muy fantástica, con algún que otro musculo que no se ni si existe, pero que queda muy chulo en una mini de este estilo. 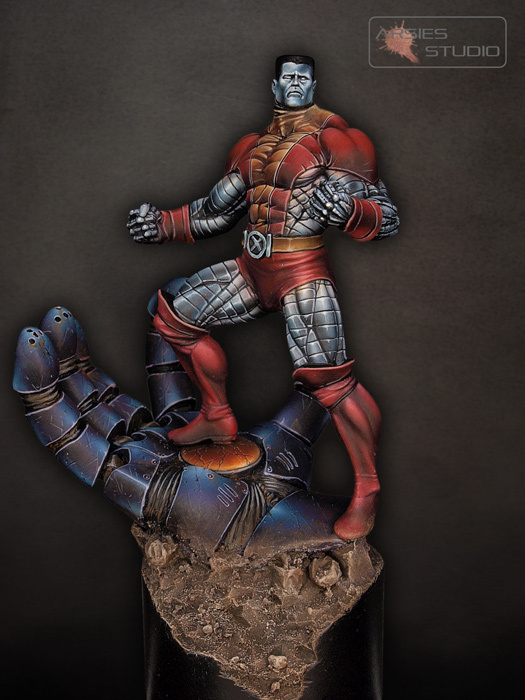 El trabajo de Metal No Metálico es muy resultón en este tipo de figuras y funciona muy muy bien en foto (el NMM siempre funciona mejor en foto, pero en este caso más aún). Admito que la mano del centinela no me gusta mucho, pero la pintura de la misma ha quedado bastante bien y estoy muy contento con el resultado. Para la peana me he inspirado (simplificando) en el trabajo de integración con el taco de madera que hizo Alfonso Giraldes en su Coloso. El suyo tiene mucho más trabajo claro, pero me gustó la idea. 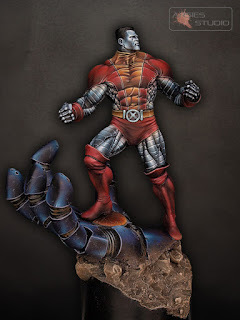 [En] I'm adding a new SuperHero to the list of those I painted before :D. This time I worked on Colossus from X-Men, from Knightmodels too in 80mm. Most of you saw the WIP pics on my facebook taken with my phone, those who not, What are you waiting for?! The figurine is a pleasure, the anatomy is fantastic, with some muscles I even don't know if already exists in a real body but that works very well on this kind of sculpture. As alwais with this brand I needed to do some repairing work (and resculpt one of the centinel's hand's finger that was missed out in the box). Painting work at first was nothing hard as the Boxart is awesome and customer didn't wanted any change. I must admit I got stoked painting reds this time and took me 3 times the stimated timeframe for this color (I does not have alwais a good day). The work on the No Metallic Metal is working very good on pictures (NMM alwais works fine on pics, but even better on this one). I admit that the centinel's hand is not of my taste, but painting work on it becomes very pleasant and I love how it looks at the end. For the base I looked at Alfonso Giraldes's (how in hell it's written this in english?) one. 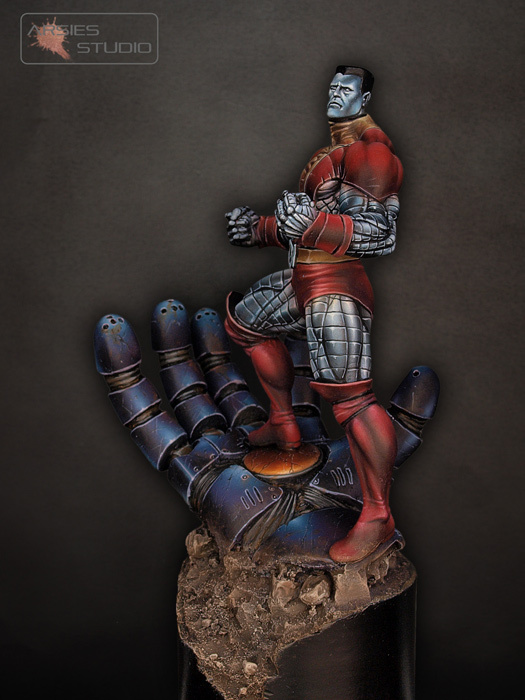 His Colossus base has much more work than mine but I liked the idea and did a simpler way of that. hope you like how it finished.